Brian Kilmeade first took a moment in the Monday morning interview to mock the mud-slinging fabricators on the left for their hysteria and wide ranging smears against Intel Committee Chairman Nunes, including false assertions that he’s a Russian agent. 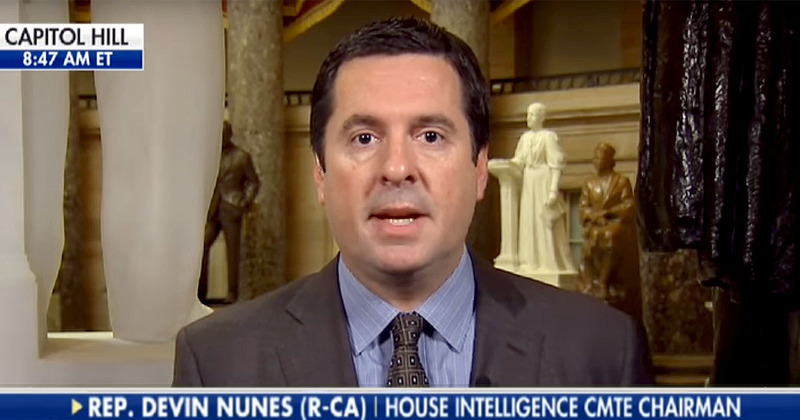 Nunes states the fact that they “have a responsibility, as the House Intelligence Committee, to ensure the American people that the FISA process is not being abused and that’s what we did.” He’s asked about allegations made by Shifty the Bobble-Head and other anti-American Democrats on the Sunday shows a day earlier, including claims that the release was coordinated with the White House. And so, ” says Nunes, “what do they do? They attack people who are trying to get to the truth.” He’s asked about an Axios report that there are five more memos coming, which would also include the State Department in its revelations of misconduct. Nunes explains the process that they were forced to use to put out the first memo on FISA abuse will likely not be required in the future. The State Department is the next target, but the process of their investigation and release of information to the American people will probably be different and perhaps less confrontational. If I remember correctly, the Dems almost got Nunes removed or shutdown. The Rs so far have not been able to get ahead of them. I hope the next step comes quick and actually indicts someone. Sessions must still be napping. Maybe they did away with Sessions and put in a look alike who is working for the swamp. It was a Soros-backed ethics ‘investigation,” Ben – sidelined him for eight months before he was found to have done absolutely nothing wrong. They might want to check to see if Sessions has a pulse, there was a guy who looked like him at the state of the union, but he looked far too happy and confident for it to have really been Sessions. Soros needs to be dropped in Moscow, I think Putin would take care of him. LOL. He did look too confident. this bubblehead from Kalifornia is the one ACTING LIKE A SPY, HE CONTINUED TO LEAK AND LEAK AND WE ALL KNOW IT. and it’s HIM, SCHUMER, POLISI WHO ARE CREATING OBSTRUCTION IN EXPOSING THE TREASON AND CORRUPTION AND CRIMINAL ACTS OF THE FBI AND DOJ NOT NUNES OR THE GOP. and he PROVES IT EVERYDAY.